Martin Salter spoke for Sea Angling in the House of Commons, attacking the Fisheries Minister, Jonathan Shaw for reneging on implementing an increase in the minimum size of bass. It was a robust defence of the NFSA and BASS's stance on raisig the minimum size of bass to make sure female fish spawned at least once. Following is a press release on his fifteen minute Adjournment Debate attack on the Fisheries Ministers decision from the NFSA issued on November 26th. November 26 2007 Minister abandoned fisheries science, says MP The government has “flown in the face” of its own fisheries advisers, Cefas (the Centre for Environment, Fisheries and Aquaculture Science), in refusing to increase the minimum landing size of bass. The decision looked after the short-term interests of the inshore commercial fishing fleet rather than the long-term interests of the species and the environment, according to Martin Salter, the government’s own parliamentary spokesman on angling. He told the House of Commons (on November 22) that just two years ago Cefas had recommended the size should be increased. “It is incumbent on us to take the long-term view. The science shows that, although increasing the minimum landing size for bass would mean a short-term depletion in the fish available to be … caught by the commercial sector, there would be a long-term increase.” Thanking him for expressing the anger and dismay of sea anglers at the decision, Richard Ferr�, the chairman, of the NFSA said in a letter: “We are not na�ve enough to expect an immediate U-turn but hopefully it will encourage the minister to take some other rapid actions to rebuild confidence.” Mr. Salter said increasing the landing size to 45cm would double the weight of sea bass which was a valuable recreational fishing species. “Just as people spend a lot of money to catch quality salmon - far more than salmon would ever fetch on a fishmonger’s slab - people will spend a lot of money to enjoy quality recreational bass fishing.” The optimum spawning size for female bass was 42cm. It was simple conservation to give every species the opportunity to breed once to promote sustainable fishing. Mr. Salter said he had tried to make a case for a sea angling licence but he absolutely agreed with the National Federation of Sea Anglers that this could only happen if there was a significant improvement in the sport available to sea anglers. The minister’s decision had “driven a coach and horses” through the government’s new strategy for recreational fishing and through any attempt to make a case for a licence. 155 anglers fished in the Open Shore at Slapton/Beesands at the weekend, with around 30 returning to the scales to weigh-in their fish. Fish caught included Flounder, Dab, Pollack, Coalfish, Pouting, Bream, Bass, Dogfish and Whiting. The weather on the day was forecast good but as the day went on the wind and rain arrived. In first place was Chris Equall from Cardiff who weighed in a Dab of 0-15-6 and a Dogfish of 2-2-4 (164%) this won Chris the �150 cash first prize. In the runner up spot was Steve Floyd from Mortenhampted. Steve also caught a dab and Dogfish combination for 130%. Third spot was filled by Ben Stockley from Weymouth with 127% (Dogfish/Whiting). Prizes down to 12th place were awarded by Julian Shambrook who kindly provided some good sponsorship on the day. The Team Shield this year was won by Team Anyfish Anywhere and they were J Shambrook, M Stote, C Equall and D Chidzoy. The pool money for the single best fish was awarded as follows, 1/ Ashley Cockram with a Whiting of 1-6-6 2/ Dane Lane Whiting 1-5-6 3/ Chris Equall Dogfish 2-2-4. There was a very disappointing attendance at the Torbay Sea Angling Festival AGM, with just eight people turning out on Tuesday 8th January 2008. Following the reading of the 2007 minutes, chairman Jim Laing made his report, his last before retiring, and welcomed those who had attended, before asking where the others were! However, he said that he was concerned over the future of the festival as it has become more and more difficult to get volunteers for the committee and the posts concerned. PLEASE EMAIL THE CLUB IF YOU ARE INTERESTED IN VOLUNTEERING. Despite early appeals, there was no-one to take on the post of secretary this time. There is a desperate need for action by all the Bay clubs, for the festival was a success this time, but for how long! He ended by thanking all those who had worked hard through the year to make the 2007 event a success, and the good weather had seen quality fish caught. The website set up by Mike Concannon was a success, and he felt that it would be a shame for the festival to perhaps fold after 40 years, but unless more helped out there appears no alternative. Secretary Mike Concannon gave his report, thanking all the sponsors for their massive support, especially ABU Garcia UK for the quality prizes they put up. Treasurer Matt Dart gave a balance sheet report with some items still to be accounted for, but taking into account the stocks on hand, both held over prizes and new entry books, the break even point was very acceptable, and expenses should be lower in the coming years. Entries had been increased by more than 200 this past year, and with many coming from the middle of the country this kept the event as a national one. The election of officers followed, all proposed at the final committee meeting, and Jim Ling stepped up to be president. Other posts: Chairman - Paul Cottell; Vice-chairman - Tim Churchward; Treasurer - Duncan Middleditch; Cup Custodian - Matt Dart; Weigh Master - Tim Bird; Brochure Co-ordinator - Doug Mosedale; Advert Co-oridnator - Jim Laing; Minute Taker - Joan Mosedale; the posts of Secretary and Information Officer stay vacant. The clubs with delegates present were Brixham SAC and Torbay & Babbacombe ASA. It was disappointing to see none of our club members (PSAA) present. A cargo ship abandoned by its crew after she listed to 40 degrees off the Devon coast has sunk. The Maritime and Coastguard Agency (MCA) said the Ice Prince went under at 12.45am local time. The Greek-registered ship was carrying a cargo of 5,258 tons of sawn timber. Some 20 crew, including a man with a broken leg, were rescued by helicopter and lifeboat in storm conditions on Monday night after the vessel's cargo of timber shifted and she began to list. At a quarter to one this morning, (Tuesday 15th January 2008) the general cargo vessel Ice Prince sank in very rough weather approximately 26 miles south south east of the Portland Bill," a MCA spokesman said. "She had been monitored throughout the evening and night by the French Coastguard tug Abeille Liberte and a further JP Knights tug, the Anglian Earl. Salvors are aboard both tugs." The spokesman added that both English and French Coastguards were warning approaching shipping of the hazards in the area. There is a lot of timber just floating around in the channel. "Just before she sank, the crew of the Abeille Liberte reported that further deck cargo had been lost to the sea and that the angle of the list had increased," the spokesman went on. He added that visibility was very poor in very rough weather in the Channel and the tug was remaining on scene as a guard ship to the wreck. A counter-pollution surveillance aircraft was expected to fly over the scene at first light to see the extent of the debris on the surface of the water. The 6,395 ton Ice Prince sent out an emergency call at 7pm on Sunday after getting into difficulties. 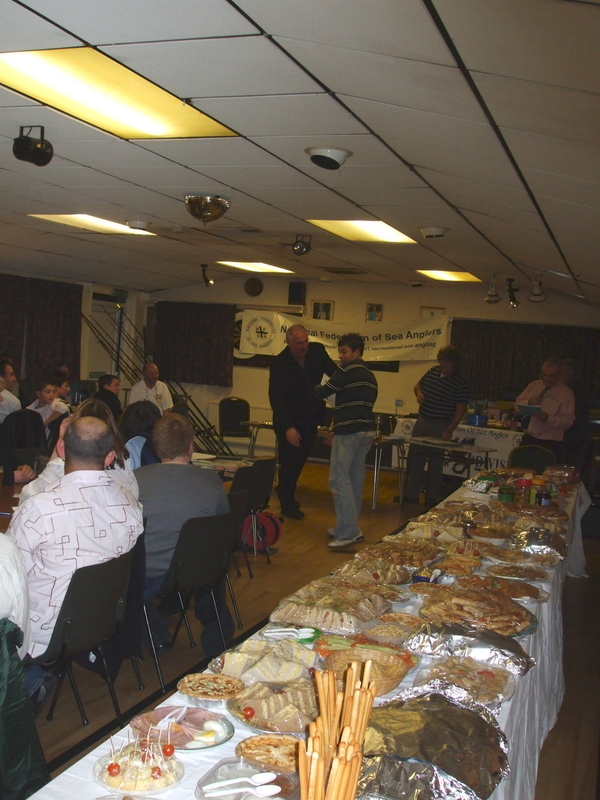 Last night (Saturday 19th January 2008) the Wyvern Presentation Night took place at Exeter and around 80 people attended the function. The evening started with a slide show and talk from Peter McConnell, who is the Chairman of the BASS society. Peter explained what the BASS society had been pushing for since their formation in the early 1970’s and most agreed on the night that there were more and bigger Bass around in the 60’s and 70’s than there are now and with help from the BASS Society we are all hoping for some changes in the future. 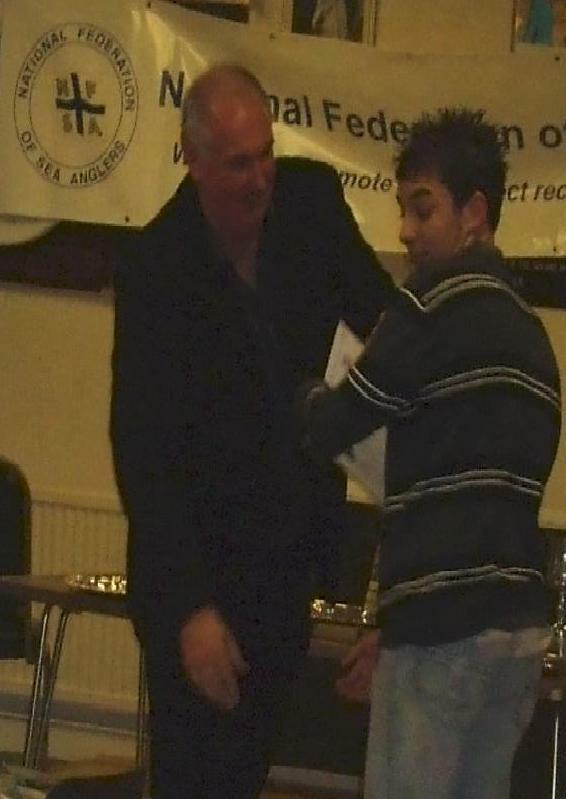 The main presentation then followed straight on with all the major trophy winners and all the fish of the month’s results for 2007. In the fish of the month awards, some 120 medals and certificates were handed out to the winning clubs who came from an area from West Bay down to Plymouth. The Division’s major award for the best specimen fish through the year went to Steve Fedrick of the Rodbenders SAC. Steve caught a boat Cod of 33-13-0 (198.8%) and this won him the Castle Trophy Tray and a cheque of �100 to give to his chosen charity (National Liver trust). In the junior section James Eden also of the Rodbenders won the best fish from the junior boat, James landed a Garfish of 2-6-0 (158.3%) and this won him the Watney Mann cup. The best junior shore section was won by Aaron Nathan of Paignton SAA with a Mackerel of 2-4-12. Other Paignton SAA club members also took certificates and medals they were Juniors Steven Amer - Luke Davies - Aaron West - Liam Cosgrave and Seniors were Steve Underwood - Carl Underwood - Mike Barnes & John Case. Steven Amer also had a certificate for a Wyvern Boat Record Cuckoo Wrasse. Other awards made on the night were :- Best specimen by a lady Shelia Andrews (Roving Rods SAC) with a Small Eyed Ray of 10-12-8. Best Flatfish went to Dennis Retter (Honiton SAC) with a Sole of 3-1-0. Best Bass went to Andy Plant (Stonehouse SAC) with a fish of 11-5-0. Best Conger went to Luke Stewart (Teignmouth SAS) with a Conger of 69-6-0. Best Bream went to Clive Leythorne (T and B ASA) with a fish from the shore of 3-8-8. On the night there was a special award made to Barrie Nockolds, Barrie had been on the Wyvern Division for many years and had helped so much for anglers over the years. Barrie was presented with a special award from the NFSA and the Wyvern Division. On the evening the Division also announced that they would be pushing a new venture in 2008 , it would be called the ‘Take Five’ Initiative and it is aimed at getting everyone to help, picking up litter around the beaches and fishing spots. It was also announced that dates would be released soon for people to take part in a beach clean. At the end of the night everyone enjoyed a superb free buffet put on by the Wyvern Division. It has been reported that a 20lb 8oz Thornback Ray was caught from shore on Friday night (25th January 2008) by a Teignmouth member in the region of East Portlemouth near Salcombe,these reports are still to be confirmed. More info will be posted as soon as possible. The current British Record for this species from shore stands at 21-12-0 caught in Scotland. IT HAS NOW BEEN CONFIRMED THAT - The massive ray weighed in at 20.8.0, just 1.4.0 short of the British shore record; it was caught by Martin Cockran a member of the Teignmouth Sea Angling Society. Martin was fishing with other Teignmouth club members in the Salcombe Estuary for thornbacks through the night when the ray grabbed his bait in the early hours of Saturday morning around 2am. At first when weighing it was thought to be over the British record but when the ray was officially weighed in, there was a slight disappointment when it was realised it was just short of the British record. It is a new Teignmouth club and, a new Wyvern Division record. The bait used was peeler crab. The ray only looked small but it was very thick,still an excellent fish from shore. It is the time of the year the big thornbacks move inshore and into the rivers to breed.